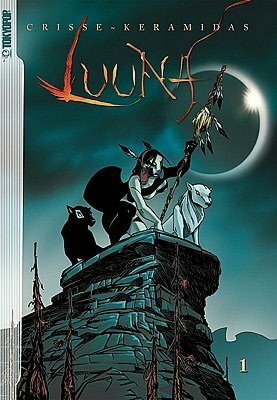 Luuna: Volume One contains the first two chapters of the Native American-themed graphic novel by Crisse and Keramidas. I should say I am not very familiar with graphic novels, so reviewing this is somewhat of a new experience for me. The art is brightly colored and stunningly beautiful, but I find the story lacking in oomph, not to mention logic. The story goes that Luuna, the young daughter of the chief of the Paumanok tribe, is about to embark on her Vision Quest and meet her totem, the animal spirit that will be her guide through life. But this is a cursed night that belongs to Unkui, the Evil One, and he demands her soul. However Hohopah, the Heart of the Forest and apparently Unkui’s opposite, tries to protect young Luuna and a bargain is struck. They will share her, and as a result she receives two totems, a black wolf and a white wolf. It is predictable which is good and which is evil. Somehow the black wolf apparently will take over her soul periodically, making her kill, and so she has to leave her tribe to protect them. It didn’t make much sense to me. The title character, Luuna, is somewhat uninspiring, and seems to be a stock character that could be replaced by any other “Indian Princess” in the genre. But, this is the first installment of the series, so it is quite possible that her character will deepen over time. However, I am completely uninterested in the story. Unkui feels more like a Satan/Devil character from the subconscious fears of modern Judeo-Christian Europeans than something truly Native American. The battle between Evil (in the form of Unkui) and Good (in the form of Hohopah), with Luuna’s soul in the middle, is quite recognizable as a Christian idea. There are even rogue Indians who worship Unkui in exchange for power (devil worshipers). It is a Christian story dressed up in buckskin and feathers. This whole comic smacks of cultural appropriation to me, and the “Magical Injun” trope. But not every reader is as analytical as I. If you are looking for a fun story with little depth, Luuna could very well work fine for you. If you are looking for something even slightly authentic, or for useful lessons about life, look somewhere else. [Amanda Sioux Blake is the keeper of the Temple of Athena the Savior, Alexandrian Tradition, and the author of Ink In My Veins: A Collection of Contemporary Pagan Poetry and Songs of Praise: Hymns to the Gods of Greece. She is currently working on the forthcoming Journey to Olympos: A Modern Spiritual Odyssey.